We are pleased to announce that the HBGTP has recruited a new Manager! Elinor Davies will be a familiar face to many of you as she has been with the HBGTP for nearly 2 years as Training Support Officer. Elinor brings with her a wealth of knowledge on the programmes and has started her new role by recruiting trainees and placement gardens for September 2017. 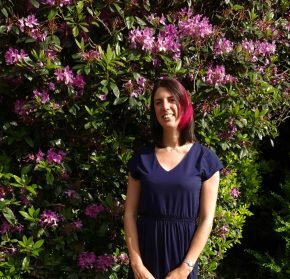 Elinor began her career as a landscape gardener, before moving on to attain a BSc in Horticulture from Reading University. She developed her interest in historic landscapes during an internship with English Heritage’s Gardens and Landscapes Team. More recently she returned to university, completing an MA in Landscape Architecture at Sheffield University. She then worked as a Landscape Manager for The Environment Partnership. Elinor will continue to cover the duties of Training Support Officer until a new staff member can be recruited to fill this role.